A diet for osteoporosis ensures you get enough calcium and other bone-healthy nutrients, whether you've already been diagnosed with osteoporosis or just have a lot of the risk factors associated with the disease and want to try to prevent it. 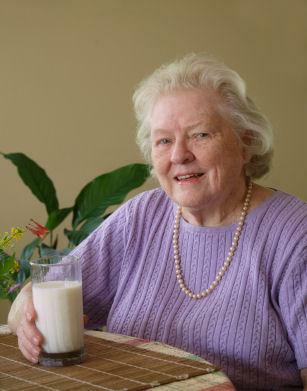 Osteoporosis is a condition in which the bones are very brittle and can break easily. Bone fractures are common in the hips and legs, making it impossible to walk until the fracture heals. Osteoporosis is common among older women in particular, but these days many younger people have bone health problems because of crash dieting and obesity. The treatment is the same as the preventative method: eating a diet rich in calcium and performing weight-bearing exercise to keep bones healthy and strong. The main thing you will probably hear from your doctor when you ask about the right foods to eat in order to treat or prevent osteoporosis is foods rich in calcium and vitamin D. Both of these substances are vital for strong bones, and the body needs vitamin D in order to process calcium, so taking both together is a good idea. Today there are many products fortified with vitamin D, calcium or both. Orange juice is one dietary staple you may want to look into adding if you don't already drink it. In addition to adding more calcium and vitamin D to your diet, you should make an effort to eat a healthier diet generally if you have not been practicing healthy eating in the past. This means cutting out fatty meats and processed foods as much as possible, eating more fruits and vegetables, and, of course, piling on the low-fat dairy. Try to get at least one source of calcium and one of vitamin D at every meal, since your body can only process so much calcium at once. Have eggs and yogurt for breakfast, for example, add spinach to your salad (and fish on top) at lunch, drink fortified milk for snacks, and so on. In addition to eating a good diet for osteoporosis, it makes good sense to add a little exercise, especially if you've been lax in this area in the past. Always talk to your doctor before you start exercising, especially if you have had any fractures in the past. Exercise for the person with osteoporosis does not mean spending hours each week in the gym. Beneficial exercise can be as simple as walking around the neighborhood and doing some gentle exercises with light dumbbells. The key is to go for weight-bearing exercises, which means that you're actually using your body weight instead of having your weight be carried along (as when riding a bike or swimming, for example). A 30-minute walk most days of the week, combined with some basic strength-training exercises with light weights, can help build bone mass and give you better balance, which is so important for preventing falls. In fact, you might want to consider taking up yoga, which both strengthens your muscles and improves balance and coordination, meaning you'll be less likely to fall and more likely to be able to help yourself back up if you do. Osteoporosis does not have to mean the end of physical activity. In fact, the diagnosis can open up a whole new phase of life in which you are more mindful of taking care of your body, including how you move and what you fuel it with.